Here’s a view of our room as you come to the top of the stairs. Our homeschool room is in our loft. You can see our bean bag pile reading corner on the right, our giant IKEA table in the middle, and our awesome IKEA shelves on either side. I added a fun new thing this year and you can see them on the back wall between the windows. 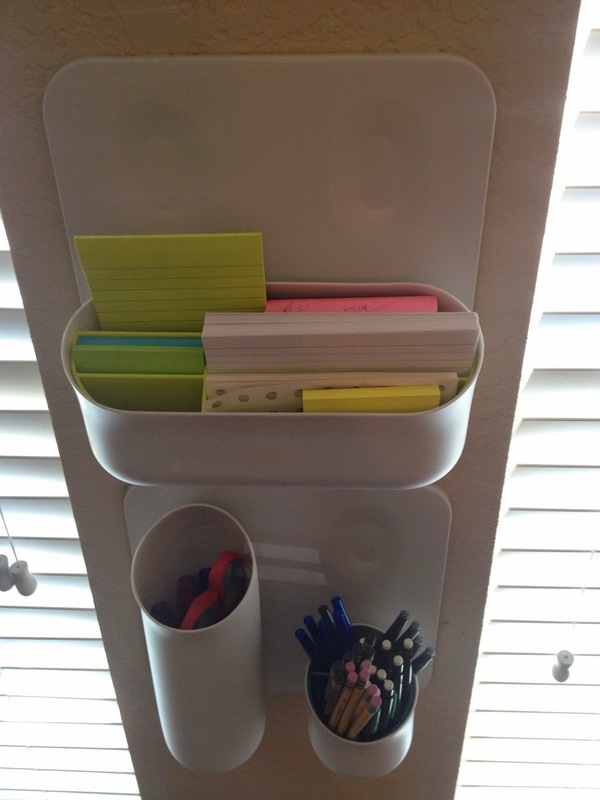 Those are magnetic boards that hold pencil cups and containers for paper, sticky notes, and index cards. My hubby picked those up at the Container Store. They are awesome! Here’s a close up of my new magnetic boards. They look like giant Lego blocks. I’ve stocked my containers with pencils, pens, rulers, markers, and paper. Here’s the other set of magnetic boards. I love the colorful dividers you can buy! 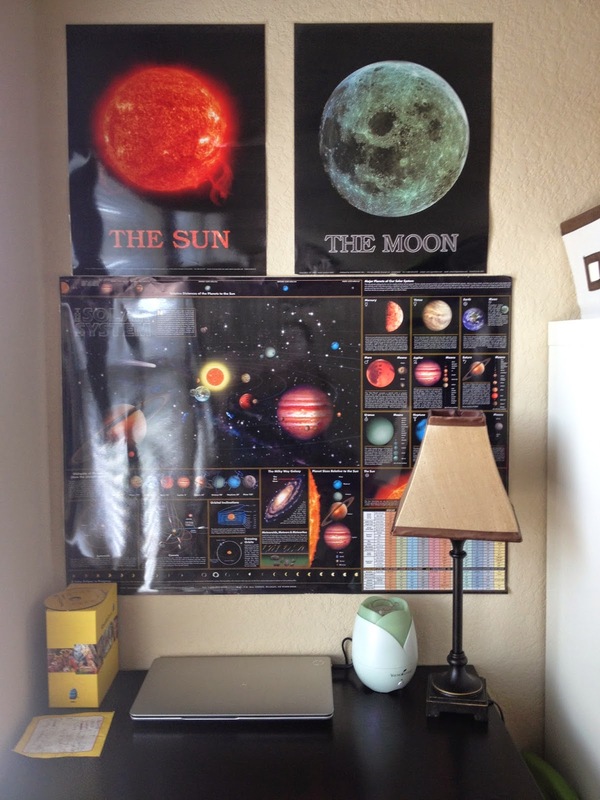 I think I might need to add some more in my homeschool room. Unfortunately, my hubby bought the last sets in the store! We’ll have to make another trip! Here’s a shot of the right side of the room. The kids have a computer desk where they take turns typing. The white bookcase holds all of our read alouds, readers, and history books for the year. There are math maipulatives and totschool toys in the black tubs on the bottom. And of course we have our comfy bean bag reading chairs close by. Why yes, we will be studying some astronomy this year! And can you see my essential oils diffuser? We love to scent our homeschool room in the morning while we work! Here are some of our read alouds and readers. Can you see my colorful coding system? I use electric tape to color code all my books by grade level. Can you see my little yellow sign on top of my shelf? It says, “I am silently correcting your grammar.” I might be a grammar nerd! I love the drawers on our table. Each side holds the curricula for each child. This is Bee’s set of drawers and Ladybug uses the bottom drawer for her preschool books. Here’s the left side of our school room. 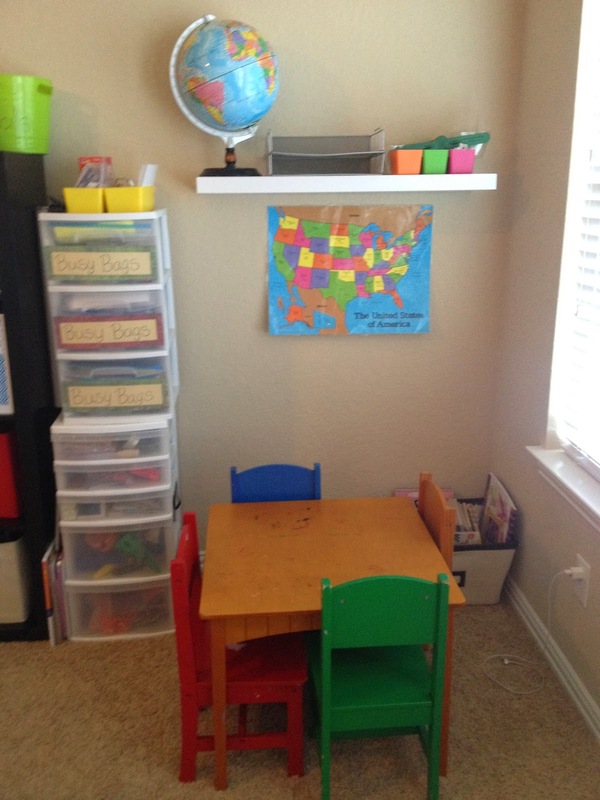 I have a little totschool corner where I color and do work with Ladybug and Punkin. 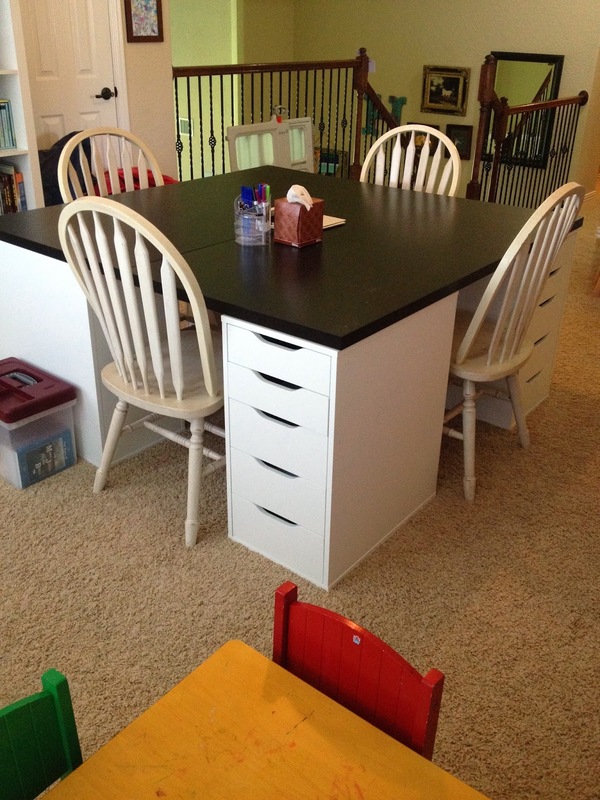 The clear plastic drawers hold busy bags, craft supplies, and totschool manipulatives. There is a giant canvas tote of coloring books hiding behind the table. And there is my very well-loved US map on the wall. It’s time to find a new one! And I need to find a world map as well. The colorful bins hold flashcards. Here is our other bookshelf. This black shelf holds teacher manuals for me and notebooks for each of the kids. I spent some time with the printer and printed all of their pages for the school year. Then I filed everything away in their binders so we would be ready for a new year. The red tubs hold math manipulatives, science readers, and spelling cards and tiles. The white tubs hold science supplies. Our Bible timeline and maps are on the side of the shelf and on the wall nearby. I love having colorful binders! I found some editable binder covers on Teachers Pay Teachers and made covers for everyone. Now my shelves are colorful! This is our art corner. I have a cabinet full of art supplies and art books and DVD’s. The little art table has seen many artsy messes in the past few years! 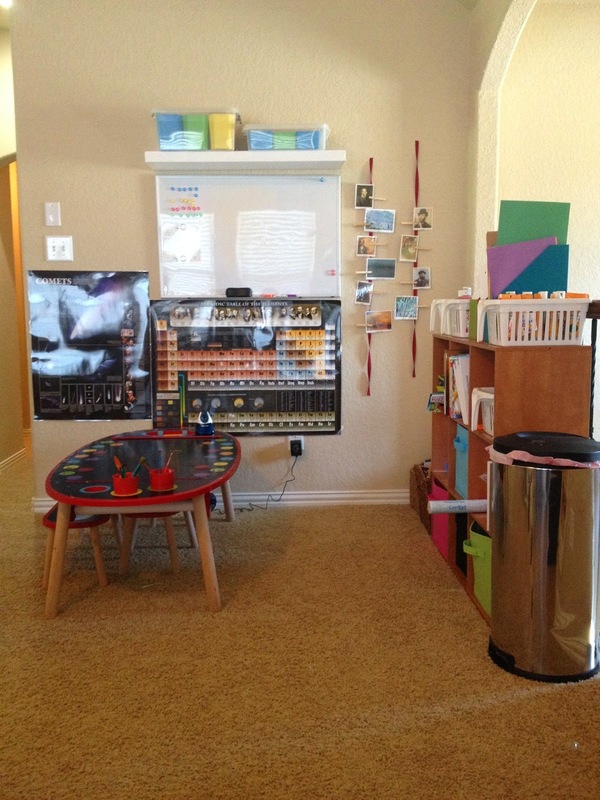 Here are our paints, papers, pastels, clay, and the ever important trash can! The wall above the art table has some science posters and our whiteboard. Above the white board is a shelf that holds some divided tubs. They hold the art supplies that I want to keep away from little hands-glue, scissors, permanent markers, charcoal pencils, and artist quality paintbrushes and colored pencils. I wanted a place to display my art cards and my hubby didn’t want to run any more errands. So he hung some ribbon on the wall so I could clip on my cards. I’m still searching for cute baby clothes pins for my wall. I plan to let the kids decorate the tiny clothes pins and use those to hang my cards instead of the giant pins. There’s my chair and all of our drawers full of books and curricula. The kids also have a drawer divider in the top drawer where they keep their pens, pencils, markers, crayons, erasers, and highlighters. I keep Kleenex, marker boards, erasers, and a cup of pencils, pens, and dry erase markers on the table. Our room would not be complete without a baby gate to keep little people away from the stairs! So, there is a tour of our room for the year! I can’t wait to get started the day after Labor Day! Tour some other homeschool rooms with the Schoolhouse Crew! Simply beautiful Lexi! Have a great "new year"! This is really nice! Thank you for sharing. 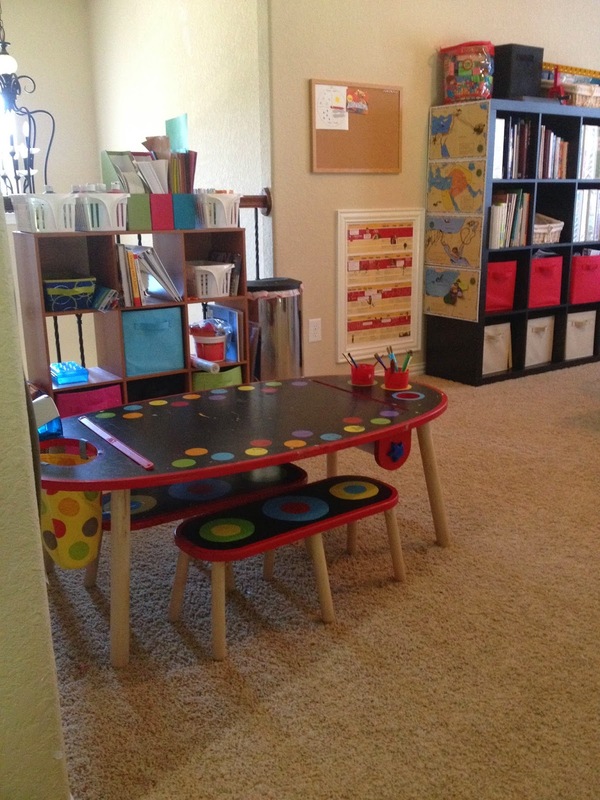 What a great schoolroom! 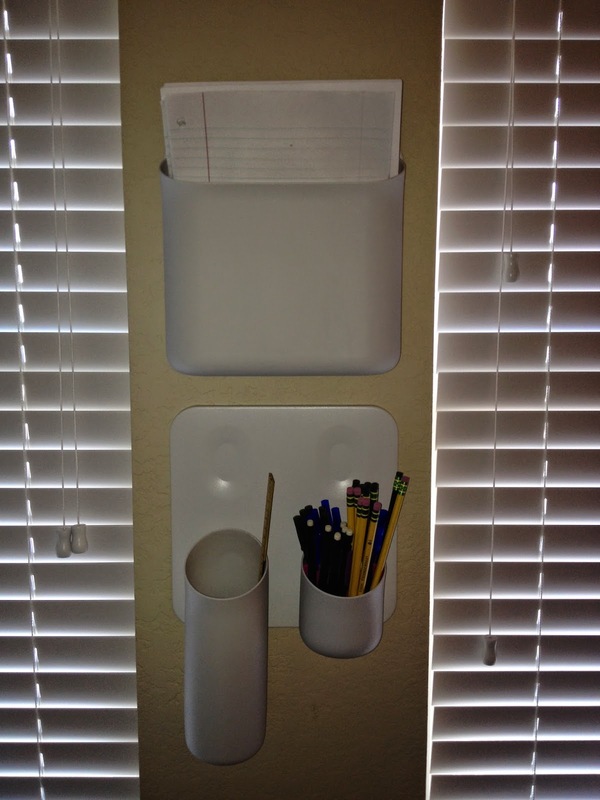 I love those magnetic boards that hold the paper, pencils, and things! Thanks! I'm very excited about our new year and I like how the room turned out. It's so nice to work in an organized space! What a great space! I just LOVE your art table. You'll have a wonderful year there! Lovely space. You used it well considering it's an open loft. Thank you! We are excited to use our room this year!